This is my last sushi theme bento but it doesn't mean I will not make it anymore. I will, perhaps not so soon after 1 week of sushi theme I think my kids and all of you got sick already hehehe ... :) I made kazari maki sushi (fancy rolled sushi) and unagi sushi for the kids' snack box today. This is my first time to make kazari maki sushi, I hope I can do it better next time with another pictures / characters for the kids bento. Inside the box : baby corn + crab ball skewers, 2 colors cabbage salad (separated the salad dressing in the small sauce container - not shown in the picture) and 2 kumquats. It's Friday already, how fast ... wish all of you a great weekend!! 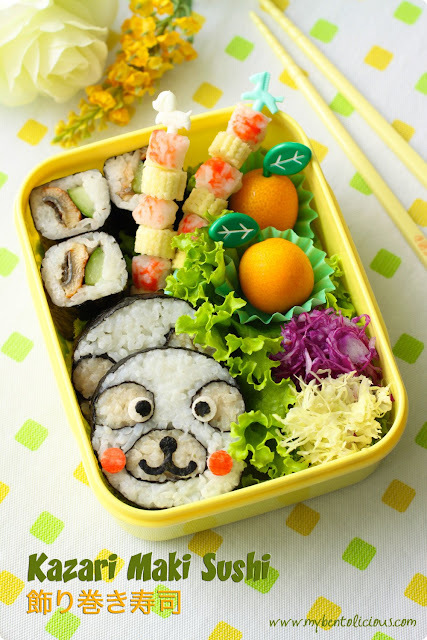 Oh my, words fail...this bento is just super-amazing, Lia! How did you make these adorable sushi? I am in awe of your talent! The whole composition is so beautiful with delicate flowers and baby corn/crab skewers! If this is not bento art....nothing is! Brava! Lia, I couldn't believe what I saw. You are the master of bento maker! last month, I bought a cookbook how to make fancy sushi, and till now, I haven't tried yet. I forgot the author's name. The book was translated from Japanese. @Indonesia-Eats : Thanks a lot Pepy! Oh Japanese cookbook in English is better since I can't read Japanese. If you don't mind, would you inform me the book title and the author's name later? Lia, those are fantastic! I am terrible at rolling sushi, you need to teach me how! :D Beautiful sushi bento. @Aux délices des gourmets : Merci beaucoup! Lia! Please, please teach us how you did this. :) But even if you did, I'm not sure I would be able to duplicate your talent. Wow. Just wow! this just makes me happy. and hungry! Wow Lia those are amazing! 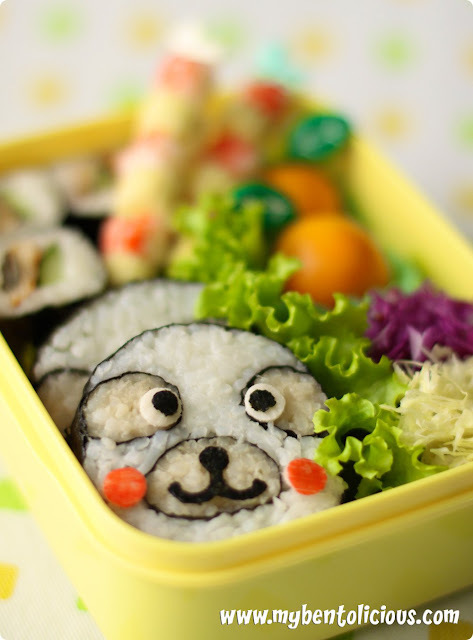 very creative, Lia Chen.. i m sure your kids look forward to each day of your bento creation! oooo....u got me with this!! lovely, i wish i could make this as neat as u. @Kids Dream Work : Thanks a lot!